Anyone who used a Microsoft product in the last 16 years, whether it’s been Windows or Office, has experienced the software activation process; in which a license key is used to “lock” a product instance, you paid for, to a specific device. In the case of Office, you are even allowed to unlock and re-lock the instances you paid for to different devices, using the same license key. This type of capability is made possible with the use of a Software License Manager (SLM); like the Software License Manager Plugin for WordPress. Our software license manager plugin can be used to lock a web application to a domain. Where Do License Keys Come From? An SLM is a back-end service, on an Internet server. 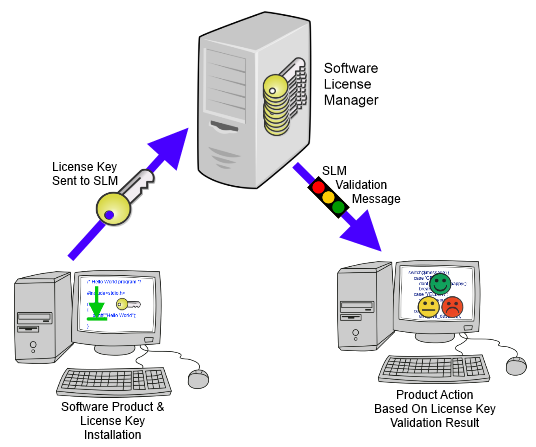 Whenever a licensed product is sold, the SLM issues a license key to the purchaser. An eCommerce application like eStore can easily be integrated with an SLM in order to facilitate delivery of the license key to the purchaser, along with a download link to the purchased product. 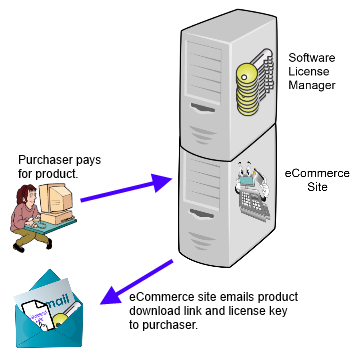 The purchaser then uses the license key to authorize use of the product, on a specific device of their choosing. Sir, May I See Your License? Product activates or continues functioning. Product enters “reduced capability” mode. Product stops working or deactivates. Using an SLM to actively track and manage license usage makes economic sense. By tracking and controlling the number of legitimately licensed product instances; developers no longer have to factor lost sales, due to casual copying (piracy), into their product costs. Lower product cost means increased sales. SLM can even provide remote disablement capabilities. This is useful for subscription based licensing, enforcement of contractual obligations, or compliance with export control (or other) restrictions. In the next article on SLM, we’ll cover how software products communicate with SLM, like the Software License Manager Plugin for WordPress.